Outgoing Prime Minister David Cameron faced increasing pressure to speed up “divorce” talks with the EU as Brussels made it clear it wants the UK out of the union as soon as possible. Prominent Brexit backers in the Tory party also expressed concern about Mr Cameron’s plan to let the situation drift until he formally leaves Downing Street in October. Leading Leave campaigner and Tory MP Bernard Jenkin insisted it was unrealistic to wait until the autumn. “I think there is a problem just saying ‘right, we’re not going to do anything between now and October’ to address the European Union relationship, because they don’t want us hanging around and destabilising all their arrangements. They want certainty, and I think we should be able to do this more quickly,” he said. The call chimed with the views of European parliament president Martin Schulz, who warned the EU would not be held “hostage” while the Tory party squabbled over its next leader. Mr Schultz insisted that uncertainty was “the opposite of what we need”, adding that it was difficult to accept “a whole continent is taken hostage because of an internal fight in the Tory party”. In a blunt sign of Britain’s new status in the departure lounge of the EU, it emerged leaders of the remaining 27 member states would meet to discuss the emergency situation without Mr Cameron present on Wednesday. The move came as embattled Labour leader Jeremy Corbyn was set to face down a growing wave of criticism against his role in the referendum with a speech on immigration and the consequences of Brexit. Mr Corbyn has rejected calls for his resignation amid growing fury at his failure to galvanise the party’s traditional supporters to turn out for Remain as many Labour MPs express concern at the possibility of him leading the party into a snap autumn general election. The Labour leader is facing a vote of no confidence from some of his MPs, with one senior source describing the mood within the party as one of “utter devastation”. Former shadow minister Tristram Hunt told BBC Newsnight he was “not convinced” Mr Corbyn had the abilities to press the Labour cause in the looming negotiations with the EU on withdrawal. After what some observers described as one the most significant days in British politics since the end of the Second World War, the Tory party was coming to terms with the ramifications of the pro-Brexit vote which forced Mr Cameron into announcing his slow-motion resignation, and saw SNP leader Nicola Sturgeon make it clear she was preparing to push for a second Scottish independence referendum. Northern Ireland, which like Scotland, voted heavily to Remain in the EU, also saw calls from Sinn Fein for an all-island referendum with the Irish Republic on reunification. With ex-London mayor Boris Johnson firm favourite to succeed Mr Cameron at the Tory helm, Labour’s Ken Livingstone attacked media “obsession” with the pair , which he said drowned out the real issues in the debate. “It was like the whole of the media was obsessed by this sort of struggle between Cameron and Johnson as they gnawed away at each other’s testicles. “It was like civil war in the Tory party, not a debate about the economy,” Mr Livingstone told Sky News. The 52% to 48% victory for Brexit in the knife-edge referendum caught financial markets and the international order off-guard as repercussions from the move sent shock-waves across the globe. As the financial impact of the vote continued to reverberate across the world, credit rating agency Moody’s moved to change the UK’s long term issuer and debt ratings to negative from stable due to the uncertainty unleashed by the result. Mr Cameron, flanked by wife Samantha, made an at times emotional address on the steps of Downing Street as he announced his resignation. The move saw calls from anti-EU Tories for a more Brexit-looking Cabinet to be put in place soon as questions were raised about the future of Chancellor George Osborne, who kept a very low profile in the wake of the result. As the scramble to replace Mr Cameron gathered pace, Home Secretary Theresa May and Education Secretary Nicky Morgan were being talked of as potential rivals to Mr Johnson. The Lisbon Treaty sets out a strict two-year timetable for withdrawal negotiations once a member state triggers article 50 and signals the intention to withdraw. Tory former chancellor and Remain campaigner Ken Clarke told BBC Newsnight the country needed a balanced Government and a “balanced” leader. Mr Cameron said he accepted the decision of the electorate, which voted by 52% to 48% to quit the EU. He said he would leave it to his successor to invoke Article 50 of the Lisbon Treaty, which kicks off the two-year process of negotiating a new trade relationship with the UK’s former partners. His announcement will trigger a battle for the leadership - and the keys to Number 10 - likely to feature Brexit standard-bearer Mr Johnson taking on figures such as Home Secretary Theresa May, who kept a low profile in the referendum campaign. Education Secretary Nicky Morgan has talked about the leadership in the past and did little to dampen speculation by repeating her call for a woman to be on the final shortlist of two MPs which would be put to party members. In Brussels and capitals around Europe, political leaders and officials went into emergency meetings to plan a response to the UK’s seismic decisions, which sent shockwaves around the world. European Council president Donald Tusk said there was “no way of predicting all the political consequences of this event, especially for the UK” and called for calm. “It is a historic moment but for sure not a moment for hysterical reactions,” he said. Mr Cameron said he had summoned the Cabinet to meet on Monday, the day before he goes to Brussels for a summit where he will “explain the decision the British people have taken and my own decision” to leaders of the remaining 27 member states. Announcing his resignation after six years as PM - and just 13 months after securing an absolute majority for the first time - was “not a decision I have taken lightly”, said Mr Cameron. But he added: “I do believe it is in the national interest to have a period of stability and then the new leadership required. Remain supporters had to respect the people’s decision and “help to make it work”, said the PM. A clearly emotional Mr Cameron said he stood by his assertion that the UK could “find a way” to survive outside the EU. “Now the decision has been made to leave we need to find the best way and I will do everything I can to help,” he said. Minutes after the PM’s statement, Bank of England governor Mark Carney announced he was making £250 billion available to support markets, as he pledged that the Bank “will not hesitate to take additional measures as required as markets adjust and the UK economy moves forward”. Even as polling stations closed on Thursday night, most observers, pollsters and bookmakers were expecting victory for Remain, albeit by the narrowest of margins. Ukip leader Nigel Farage even came close to conceding defeat, admitting he believed that Remain had “nicked it” and vowing to fight on for withdrawal from the EU, while senior pro-Brexit Tories including Mr Johnson and Michael Gove signed a letter calling on the PM to stay on regardless of the result. But emphatic early victories in cities such as Sunderland and Swindon made clear the momentum was all on the Brexit side. As dawn arrived, it was clear that Leave had secured enough support in the English shires and former Labour strongholds in the North, Wales and Midlands to sweep aside strong Remain performances in London, Scotland and Northern Ireland. With ballots counted in all 382 polling areas - including Gibraltar, which voted overwhelmingly to stay in the EU - Leave received 17,410,742 votes (51.9%) against 16,141,241 (48.1%) for Remain. The result in Scotland is certain to create massive pressure for a second independence referendum. Former Scottish National Party leader Alex Salmond said he was “quite certain” that an effort to drag Scotland out of the EU against its will would lead to the invocation of a manifesto promise to stage another ballot if there was a “significant and material” change in circumstances from the 2014 vote. First Minister Nicola Sturgeon said Scotland had delivered a “strong, unequivocal vote” making clear that “the people of Scotland see their future as part of the European Union”. A jubilant Mr Farage declared June 23 “our independence day” to cheers from ecstatic supporters as the sun rose. But there were recriminations among Labour supporters, with influential backbench MP John Mann - one of a handful to back a Brexit vote - calling for a change in the party’s direction, particularly on immigration policy. Senior Labour figures including Ed Miliband sought to cast the result as a protest against the effects of austerity as much as an expression of desire to leave the EU. The Bassetlaw MP said the strong showing for Brexit in former heartland areas showed the party was “out of touch” with traditional voters who were “sick to death” with what they were being offered. Foreign Secretary Philip Hammond did not rule out an emergency summer budget to respond to the damage the Government expects the Brexit vote to inflict on the UK economy. Ahead of the referendum, Chancellor George Osborne warned that a Leave vote might result in higher taxes, lower public spending or both, and Mr Hammond said that the Government’s fiscal consolidation programme would now become “more difficult”. 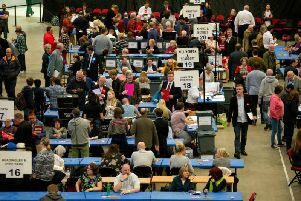 Speaking at the Electoral Commission’s main counting centre in Manchester, Vote Leave chairman Gisela Stuart said the Brexit vote was “our opportunity to take back control of a whole area of democratic decisions”. All political leaders should now “reflect on whether they have accurately gauged the people’s desire to govern themselves”, she said. The German-born MP said a calm cross-party effort was now needed to implement the voters’ decision “in the best long-term interests of this country”. And she broke into her native tongue to assure other EU nations that Britain would remain an “open, welcoming” country which would continue to co-operate with its former partners. Labour leader Jeremy Corbyn called on the PM to invoke Article 50 immediately, but leading Leave campaigners including Andrea Leadsom and Liam Fox said it was right to hold off. Some 72.2% of the 46,500,001 eligible voters turned out at polling stations, said the Electoral Commission. The total turnout of 33,568,184 was just short of the highest ever participation in a UK general election, in 1992. Cameron’s resignation speech in full.